For the I haven’t slept for more than 90 minutes at-a-time in weeks … what’s the take-home?” summary here. The choices in the baby formula aisle at the grocery store can be incredibly overwhelming. 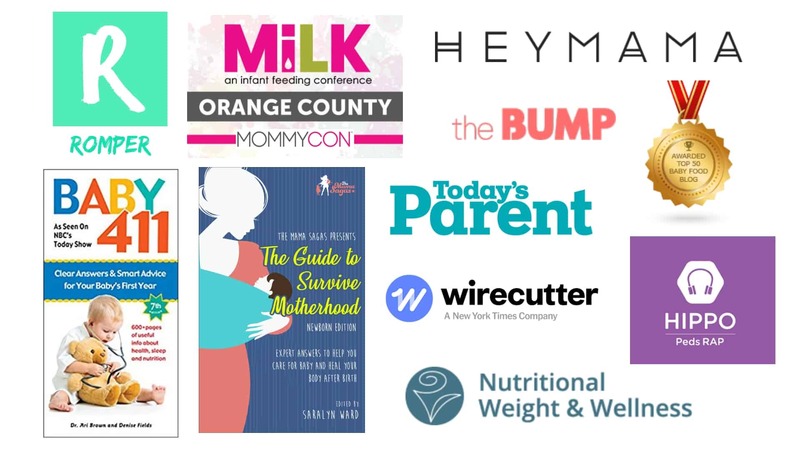 If you actually develop the courage to turn a can of baby formula over and look at the nutrition label, the panel looks completely different than you’re used to, and is very difficult to interpret. 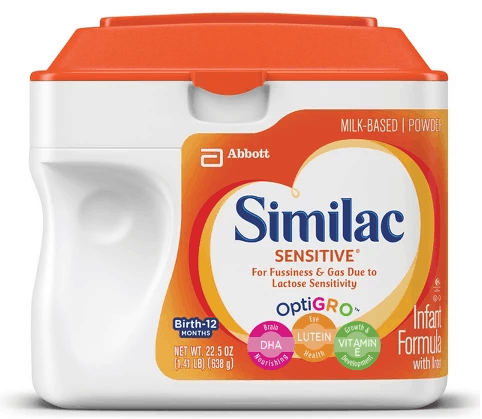 Finally, the humorously ironic truth is that the people buying infant formula are always stressed, in a hurry, and sleep-deprived… because they have an infant at home! My hope is that you have read all the other articles in this series and are now armed with the information to look at that intimidating list of ingredients with confidence! 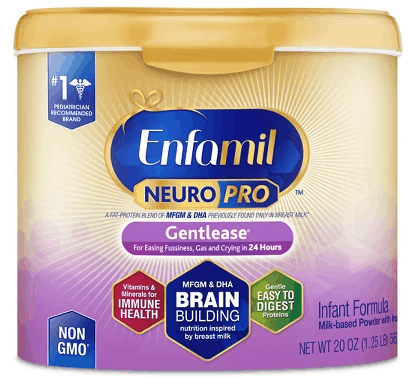 In this article, I will break down 4 example infant formula nutrition labels from name-brand formulas for healthy term babies. I’ll translate the first label completely, and then point out the ingredients of interest for the other 3 labels. Remember, ingredients are listed in order of volume – the first ingredient is the largest ingredient. Download my free Baby Formula Shopping Guide to take with you to the grocery store. 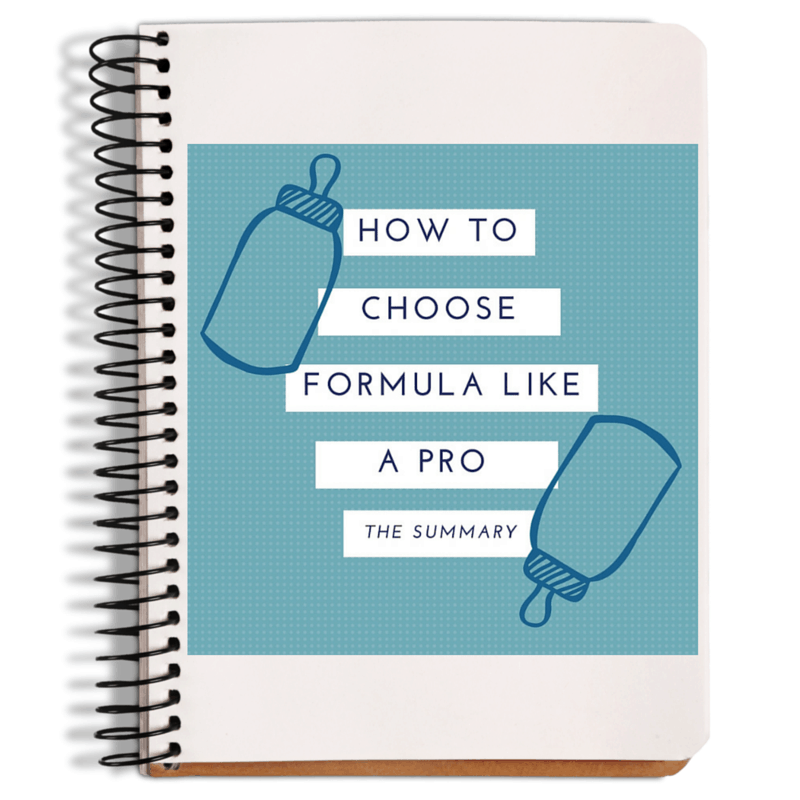 Download my Baby Formula Ingredients Cheat Sheet to help you translate all that scientific jargon into real-world language. Below the list of ingredients, I’ll walk you through each one and tell you what I do and don’t like. Protein: “Nonfat Milk” and “Whey Protein”. This is obviously a cow’s milk protein source. They have adjusted the casein:whey ratio to look more like breast milk by adding additional whey protein (excellent!). Note, these proteins are NOT hydrolyzed, they are intact (full size). Fat: “High Oleic Safflower Oil, Soy Oil, Coconut Oil”. You need a few different types of fat to mimic the fatty acids in breast milk; this is pretty standard. Note, no palm olein oil here, so more calcium will be absorbed. Specialty ingredients: “Galactooligosaccharides”. These are prebiotics, similar to (but not identical to) the kind found in breast milk. These will not be found in every baby formula. This is a great additional ingredient. Nucleotides – These are non-nutrient additions that are also found in human milk. They are not added to every formula but they’re perfectly safe. I will only point out the micronutrients of interest in this formula. Corn Syrup Solids, Partially Hydrolyzed Nonfat Milk and Whey Protein Concentrate Solids (Soy), Vegetable Oil (Palm Olein, Soy, Coconut, and High Oleic Sunflower Oils), and less than 2%: Mortierella Alpina Oil, Crypthecodinium Cohnii Oil, Vitamin A Palmitate, Vitamin D3, Vitamin E Acetate, Vitamin K1, Thiamin Hydrochloride, Riboflavin, Vitamin B6 Hydrochloride, Vitamin B12, Niacinamide, Folic Acid, Calcium Pantothenate, Biotin, Ascorbic Acid, Choline Chloride, Inositol, Calcium Carbonate, Calcium Phosphate, Magnesium Phosphate, Ferrous Sulfate, Zinc Sulfate, Manganese Sulfate, Cupric Sulfate, Sodium Selenite, Sodium Citrate, Potassium Chloride, Potassium Iodide, Taurine, and L-Carnitine. Carbohydrates: Corn Syrup Solids is the only added carbohydrate added to the formula. There will be a very small amount of lactose that comes from the protein source, so it is not technically a “lactose-free” formula. But the very-reduced lactose is one of the main reasons this formula is called “Gentle”. But remember, very few infants actually have a lactose intolerance. With Corn Syrup as the first ingredient in this formula, this baby will be eating a large amount of corn syrup. 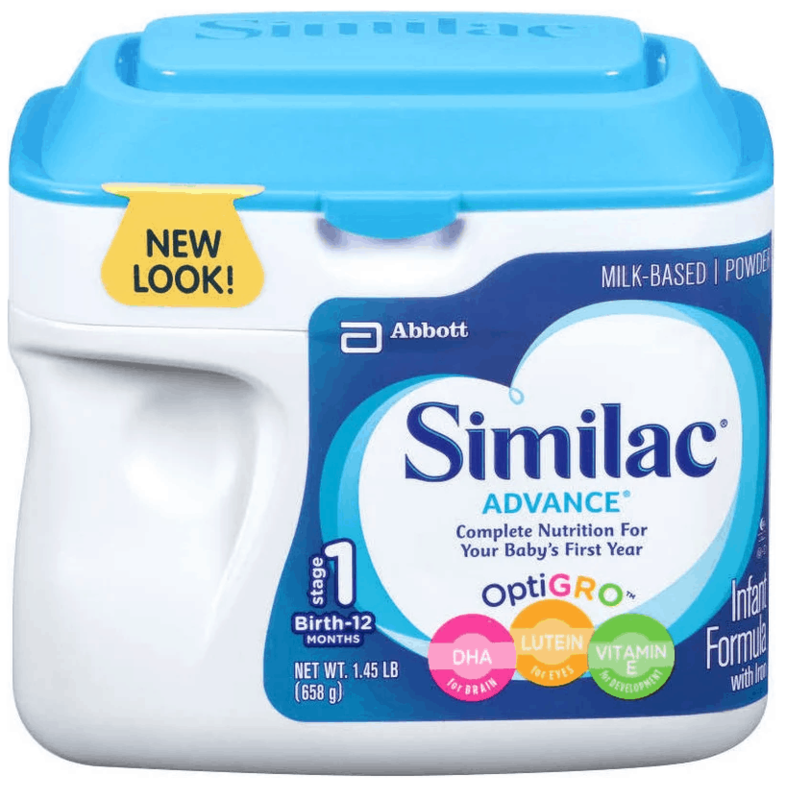 There are infants that thrive better on a lactose-reduced formula like this; but if you are just starting out, I recommend looking for lactose as the primary source of carbohydrate, unless your doctor recommends otherwise. Fat: “Vegetable Oils (Palm Olein, Soy, Coconut, and High-Oleic Safflower or High-Oleic Sunflower)”. You need a few different types of fat to mimic the fatty acids in breast milk; this is pretty standard. Note: Palm olein oil is the primary fat source of this formula which will slightly decrease the fat and calcium absorption of the formula. Specialty ingredients: “Galactooligosaccharides”. These are prebiotics, similar to (but not identical to) the kind found in breast milk. This is a great additional ingredient. Nucleotides – These are non-nutrient additions that are also found in human milk. They are not added to every formula but are perfectly safe. Protein: “Milk Protein Isolate” This is obviously a cow’s milk protein source. There is no additional whey protein, so this will have much more casein protein than breast milk. Note, these proteins are NOT hydrolyzed. They are intact (full-size). Carbohydrates: There is no lactose added to this formula, which is why it is called “Sensitive”. There will be a very small amount of lactose that comes from the protein source, so it is not technically a “lactose-free” formula. But remember, very few infants actually have lactose intolerance. Instead, the sources of carbohydrate in this formula are: “Corn Syrup, Sugar”. As the first 2 ingredients this is a huge part of baby’s diet and means (when digested), the carbohydrate source is mostly glucose along with fructose. There are infants that thrive better on a lactose-reduced formula like this; but if you are just starting out, I recommend looking for lactose as the primary source of carbohydrate, unless your doctor recommends otherwise. Fat: “High Oleic Safflower Oil, Soy Oil, Coconut Oil”. You need a few different types of fat to mimic the fatty acids in breast milk; this is pretty standard. Note: No palm olein oil here, so baby will be able to absorb more of the calcium from this formula. WHEY PROTEIN CONCENTRATE (FROM MILK, ENZYMATICALLY HYDROLYZED, REDUCED IN MINERALS), VEGETABLE OILS (PALM OLEIN, SOY, COCONUT, AND HIGH-OLEIC SAFFLOWER OR HIGH-OLEIC SUNFLOWER), CORN MALTODEXTRIN, LACTOSE, GALACTO-OLIGOSACCHARIDES, AND LESS THAN 2% OF: POTASSIUM CITRATE, POTASSIUM PHOSPHATE, CALCIUM CHLORIDE, CALCIUM PHOSPHATE, SODIUM CITRATE, MAGNESIUM CHLORIDE, FERROUS SULFATE, ZINC SULFATE, COPPER SULFATE, POTASSIUM IODIDE, MANGANESE SULFATE, SODIUM SELENATE, M. ALPINA OIL, C. COHNII OIL, SODIUM ASCORBATE, INOSITOL, CHOLINE BITARTRATE, ALPHA-TOCOPHERYL ACETATE, NIACINAMIDE, CALCIUM PANTOTHENATE, RIBOFLAVIN, VITAMIN A ACETATE, PYRIDOXINE HYDROCHLORIDE, THIAMINE MONONITRATE, FOLIC ACID, PHYLLOQUINONE, BIOTIN, VITAMIN D3, VITAMIN B12, TAURINE, NUCLEOTIDES (CYTIDINE 5′-MONOPHOSPHATE, DISODIUM URIDINE 5′-MONOPHOSPHATE, ADENOSINE 5′-MONOPHOSPHATE, DISODIUM GUANOSINE 5′-MONOPHOSPHATE), ASCORBYL PALMITATE, MIXED TOCOPHEROLS, L-CARNITINE, B. LACTIS CULTURES, SOY LECITHIN. Carbohydrates: Corn Maltodextrin, Lactose. Despite the order of ingredients, the carbohydrate in this formula is 70% lactose and 30% corn maltodextrin (I know because Gerber publishes this info). Yes, Corn Maltodextrin comes before lactose on the list of ingredients, but there is some lactose in the protein source which is how you get up to 70% lactose. 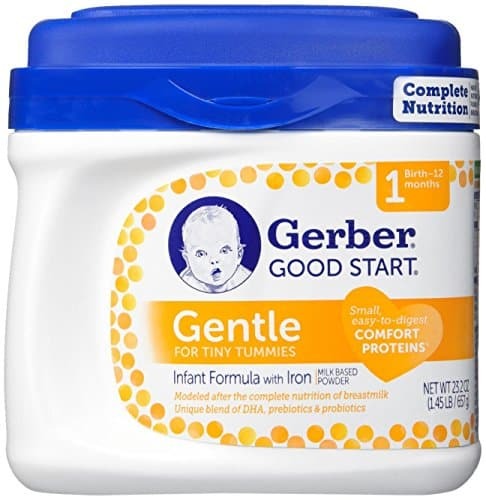 As I write this, Gerber’s formulas have the lowest corn sugar (highest lactose) concentration of any other partially hydrolyzed formula in the US. B. Lactis Cultures – This is not a “nutrient” – it’s a probiotic! (Officially Bifidobacterium Lactis). This is one of the most common healthy bacteria found in breastfed infants’ intestines. It’s super cool that this formula provides both a PREbiotic (galactooligosaccharides) and a PRObiotic (B. Lactis). Fat: All formulas will have several oils listed because you need different types of fat to mimic the fatty acids in breast milk. When Palm olein oil is the first oil listed on the list of ingredients, it will likely slightly decrease the amount of fat and calcium that can be absorbed in baby’s intestines. This may be a consideration if your baby was born earlier than 38 weeks gestation. Pre and Probiotics: Prebiotics are commonly called, “Galactooligosaccharides”. Probiotics are often listed along with the word “culture”. Two common strains are: L. reuteri  and Bifidus. Both pre and probiotics are found in breast milk and can be beneficial to your little one. If you have to choose between them, I recommend prebiotics. Micronutrient ingredients of interest: Look for nucleotides. They are not added to every formula. Also look for a source of ARA and DHA to start with (although almost all formulas have these now).